Haven’t we all had the experience? Maybe it was in your backyard as a kid or hiking outdoors. Maybe it was while dissecting in biology lab or watching the Discovery channel on TV. At some point we discovered that we are fascinated by living systems. In the Department of Biology, we share your fascination with the natural world. We believe that the study of biology will prepare you for a variety of careers where you can make a difference in the world. Our mission is to enable you to reach your potential while celebrating the study of life. Read about what inspires Dr. Jenny Gubbels to study biology. That's the answer to "What are three important features when choosing a college? "—Augustana is a comprehensive (liberal arts and professional) college uniquely located within an urban setting. It has the advantages of a city, but the friendliness of a small town. 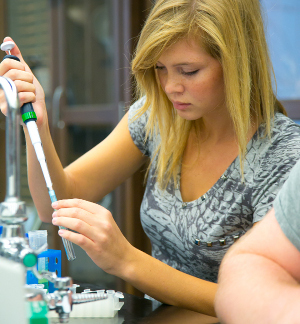 For biology majors, our location in Sioux Falls provides a host of opportunities. For example, with five hospitals and the Sioux Falls campus of the University of South Dakota's Sanford School of Medicine within 15 minutes of campus, our students shadow doctors, gain patient care experience, and work in clinical and research labs. The local high schools provide mentoring opportunities for those biology majors interested in teaching careers. Our students also take advantage of great internships and job opportunities available in Sioux Falls at the Great Plains Zoo, Hematech, SD Game Fish and Parks, Sanford Research, Avera Research, and the EROS Data Center (for satellite image analysis).